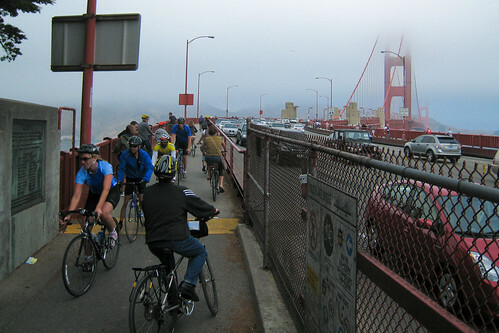 An ongoing seismic retrofit project to make California’s Golden Gate Bridge more secure in the event of an earthquake has created an unexpected safety dilemma for the up to 6,000 cyclists and 10,000 pedestrians who cross the famous bridge each day. Construction crews have temporarily closed the bridge’s west sidewalk, meaning that pedestrians and cyclists alike must share the east sidewalk, which gets as slim as 5.5 feet. While there have so far been no accidents, the Marin Independent Journal reports that sharing the sidewalk has created a clear safety dilemma and sparked disputes between cyclists and pedestrians forced to share the space. The $661 million seismic retrofit project is designed to make sure the Golden Gate Bridge can survive an 8.3 magnitude earthquake. The bridge’s west sidewalk is expected to open in October. But the safety dilemma will not be solved at this point, as the east sidewalk will be closed, meaning pedestrians will temporarily not be able to walk the entire span of San Francisco’s iconic bridge. The complete project is scheduled to be complete in 2016, so until then, be safe if you’re walking across the Golden Gate Bridge, and make way for cyclists.